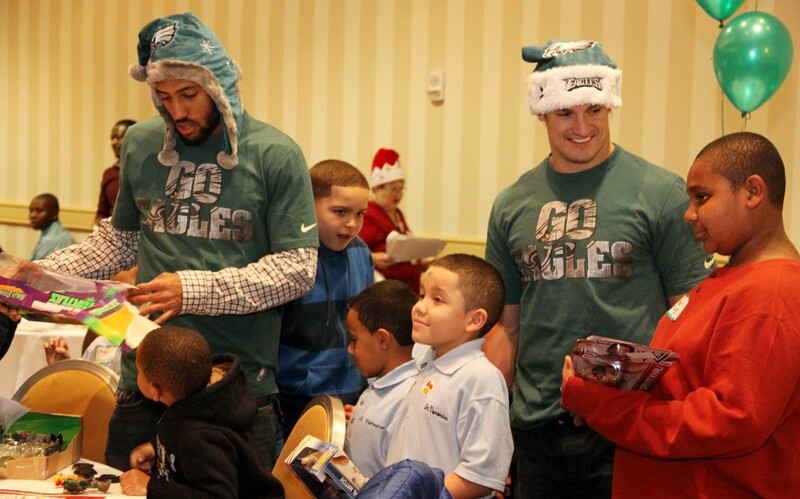 Eagles cornerback Curtis Marsh (left) and safety Colt Anderson help children open gifts they received from Santa Claus at the Archbishop’s Christmas Benefit for Children. Douglas Dunn, who teaches theology at Pope John Paul II High School in Royersford when he’s not playing Santa Claus at the annual Archbishop’s Christmas Benefit for Children, got it right. 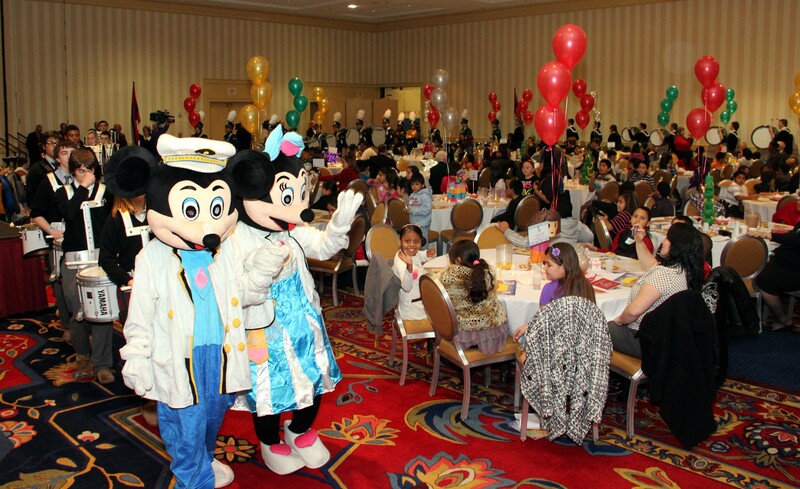 That’s a tall order, considering there were 400 children at the party representing the 16,000 children who benefit during the year from residential and community-based programs offered by archdiocesan Catholic Social Services. In a way Dunn is a newcomer at the game. This was the party’s 56th year; it was originally instituted by Archbishop John F. O’Hara, who replicated a similar program of his former diocese, Buffalo. For the past couple of decades the venue has been the Sheraton Philadelphia Center City Hotel, which donates its facilities for the annual event, held this year on Dec. 18. 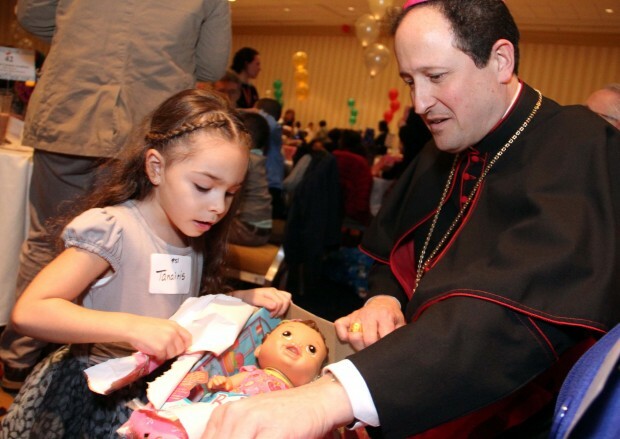 Although the 400 children are the immediate recipients, the annual party is really a fundraiser to assist all of CSS’s programs throughout the five counties of the Archdiocese of Philadelphia. Usually the event is hosted in person by the Archbishop of Philadelphia, but because of Archbishop Charles Chaput’s knee surgery, Bishop John McIntyre gladly filled in for him. In addition to the 400 juvenile honorees there were an estimated 500 Catholic high school and elementary students along to make it happen, both as entertainers, musicians and Santa’s helpers. One of the youngest groups was the cheerleaders drawn from grades one through four at St. Andrew Elementary School in Newtown, Bucks County. “It was really fun because we got to see tons of children and make them happy,” said fourth-grader Sarah Mack. Probably most people didn’t notice, but all of the Newtown kids had a gold cross and blue and white ribbon on their uniform. “This is a commemoration, a little way for us to show our support for the children in Newtown, Connecticut,” explained Chuck Dolan, one of the dads. Another regular at the party was Donald Hadfield, an expert stilt walker, who estimated he has been coming for 24 years. He’s a graduate of the Ringling Brothers Clown College and toured with that circus and also the former Royal Lichtenstein Quarter Ring Circus, a soft-sell evangelical troupe formerly conducted by Jesuit Father Nick Weber. A highlight of the entertainment was the Nativity Play conducted this year by students from St. Lucy School for the Blind/Archbishop Ryan School for the Deaf. Celebrity entertainers included the Phillie Phanatic and Swoop, the Philadelphia Eagles mascot who was accompanied by several players and cheerleaders, the latter somewhat more demurely clad than on game days. All of this of course takes organization, and they were fortunate to have as this year’s MC Jack Kelly, a CBS3 traffic reporter who knows something about keeping things flowing. The highlight, after the entrance of Santa Claus, was the distribution of the gifts by elves from Roman Catholic and Hallahan High Schools. Mario got a Batman figure; Chrystal got a Bratz doll, Kiara got a Barbie Doll. Tiana got Little Pony, Hariah got Princess Celeste. Mickey and Minnie Mouse lead the parade including a Catholic high school band at the party for more than 400 children.